When you have Type 1 or Type 2 diabetes, your blood sugar and energy levels can have a big impact on your ability to enjoy life. Insulin and medications are important, but did you know there’s another medicine that can quickly lower your blood glucose, give you more energy, reduce your risk of heart attack and stroke, and potentially even reduce your reliance on medication? That medicine is movement. With a kin, you can move better to live better with diabetes. Here are 5 ways a kin can help. Movement is what keeps us moving – and that’s especially true for people with diabetes. Physical activity can lower your blood glucose within one hour and give you more energy and strength during the day. Diabetes Canada recommends getting 150 minutes of aerobic activity a week to prevent health risks, and your doctor may have told you to exercise even more. But if you’re like most people, there are all kinds of barriers separating you from your fitter self. That’s where a kinesiologist can help. Kinesiologists are movement experts, and they are trained to work with people with chronic disease. They can explain how diabetes affects your body, and how exercise can improve your body’s sensitivity to insulin and help manage your blood sugar levels. They can also develop an exercise program tailored to you, whether you are a beginner or expert. If high blood pressure is an issue, a kin will prescribe exercises that are lower on the exertion scale, so you can control your heart rate. If you’re overweight, a kin will prescribe low-impact exercises that avoid stress on the joints – like swimming or cycling instead of jogging on a treadmill. If old injuries are a factor, a kin can prescribe exercises that will rehab the injury site or take previous injuries into consideration when designing your program by adapting exercises. Most importantly, a kin is a partner in understanding the possibilities of your body movements and in reaching your long-term health goals. They’re there to help you make movement part of your regular routine, and they’ll hold you accountable to achieving your goals. 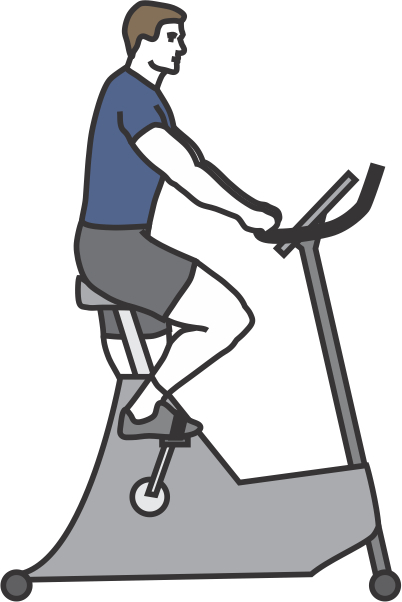 Start and end your workout with a 10- to 15-minute session on the stationary bike. Bike at a moderate intensity, so it’s possible to talk but not to sing, potentially progressing to a point where speaking is difficult. 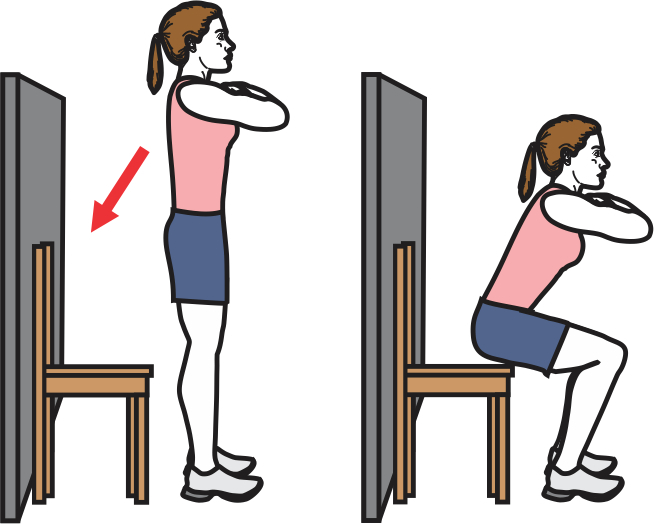 Keeping your back straight, squat into a seated position over a chair, stopping when you make contact with the chair. Start with 2 sets of 10 repetitions, taking a 30-second to 1-minute break between sets. Lay down with your knees bent, arms at your side. While engaging your core muscles and glutes, lift your core up off the ground (with your arms staying strong at your side), stopping when your back is in a straight line with your quadriceps. Start with 2 sets of 10 repetitions, taking a 30-second to 1-minute break between sets. Your blood glucose (sugar) level has a big impact on your ability to exercise safely and make movement part of your daily routine. There are two ways a kinesiologist can help. Firstly, a kin can help you understand how your blood sugar levels correspond to workouts. They’ll encourage you to monitor this as you exercise and to develop strategies to overcome any abnormalities. They’ll also teach you to read your body’s signals, like feeling low-energy, or if you’re becoming pale. A kin can help you restore your energy levels or encourage breaks, making sure you’re exercising safely. Secondly, a kin can help you understand when your medication has maximum effect. A kin will help you establish an exercise routine and will encourage you to set regular times for exercise. For example, doing all of your workouts at 10 a.m. or in the afternoon, depending on when you feel the best and what works best for you. The key is consistency. There is no universal best time of day to exercise, but there is a best time for you. With a kin, you can feel good as you improve your health. Have you experienced numbness, shooting pain, or loss of balance in your feet and legs – or find your feet look “off”? If you have been diagnosed with Diabetes Peripheral neuropathy, it is one complication that can impact your ability to get into an exercise routine. One way to prevent a setback is by choosing good socks and footwear. A kin can give you tips on choosing the right combo, or they’ll refer you to a podiatrist. They’ll also show you how to check your feet for signs of chaffing and pressure sores. A kin can also give you stretches and exercises to improve proprioception (sensation) and awareness in your feet, so you can protect the health of your peripheral nerves. With a kin, you can move your feet better. Working with a kinesiologist can help you manage the symptoms of diabetes today, but it can also help prevent long-term complications like heart disease and stroke. That’s because regular exercise will help you achieve and maintain a healthy weight, lower blood pressure and strengthen your bones and muscles. Minimize how long you sit for any period of time. Stand up and stretch every hour or two. At work, take short, frequent breaks to walk, fill up a water bottle or go to bathroom. At home, pause the show or movie halfway through and move around a little. The stats say that people with diabetes may develop heart disease 15 years earlier than individuals without diabetes, but with a kin, you can help reverse those trends. Many medications are designed to help people with diabetes regulate blood sugar, but physical activity and meal planning can have the same result. A kinesiologist can help you keep your body strong and active in combination with a dietician or nutritionist, who can help you choose the best foods to manage your blood glucose. Together as your interdisciplinary health team, they can often help people with Type 2 diabetes reduce the amount of medication they’re taking or prevent people with pre-diabetes from getting type 2 diabetes. With a kin, you can take control of your health naturally. So, how do you find a kinesiologist near you, and what can you expect? You can find a kinesiologist by visiting the Canadian Kinesiology Alliance website. During your first session, your kin will assess your health and fitness, discuss your goals and explain how exercise plays a role in managing diabetes. They’ll talk to you about your routine, your favourite activities and the level of activity you can commit to. Next, they’ll create your custom exercise program and teach you how to perform the different movements correctly. Depending on your budget, you’ll start by seeing your kin two or three times a week, and as you get comfortable, you may reduce the in-person session to once a week and then once every two to three weeks. Of course, the program is tailored to you and the way you want to exercise. A kin will work within your limits and if money is an issue, can give you exercises to do at home. Talk to a kinesiologist today, and begin the journey to moving better and to take control of your diabetes symptoms. This blog is published as part of the 2018 National Kinesiology Week campaign in support of Osteoporosis Month and World Diabetes Day on November 14th, while increasing the visibility of kinesiology through organization of promotional activities in November. The Canadian Kinesiology Alliance (CKA / ACK) represents seven provincial kinesiology associations (APKs) and more than 3,800 affiliated kinesiologists and develops strategic partnerships with other national organizations and supporting initiatives for active lifestyle. Kinesiologists provide services to enhance human movement by providing quality solutions through prevention, objective evaluation and evidence-based interventions. The ACK / CKA establishes and promotes the standards of the profession across Canada.